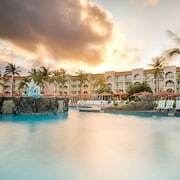 This resort across the street from powder white Eagle Beach offers 362 guest suites, and is 13 km (8.25 mi) from Queen Beatrix International Airport, and 5 km (3.25 mi) from the shopping and dining of Oranjestad. 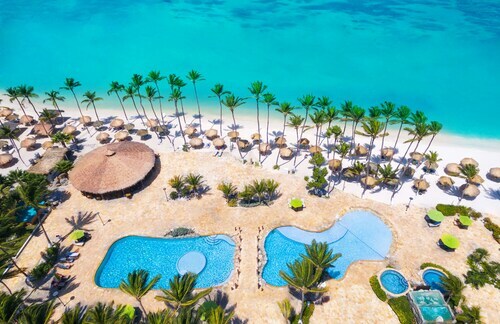 This newly renovated 15-acre tropical haven offers 357 elegantly-appointed guest accommodations in northwest Aruba, surrounded by soft sands, turquoise seas, fragrant gardens, exotic lagoons and cascading waterfalls. 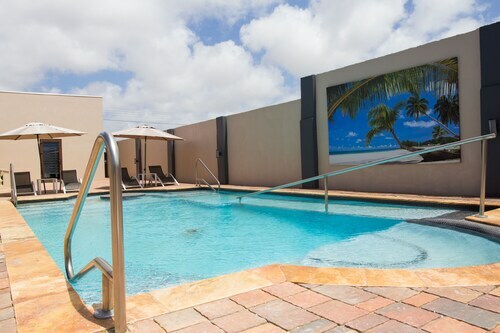 Located in the heart of Palm Beach, this resort sits on a quarter-mile stretch of white-sand beach, across the street from 2 popular shopping malls, and within easy reach lively night clubs. 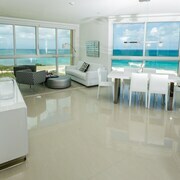 Styled like a colorful Dutch-Caribbean village, this casual hotel is situated in popular and picturesque Palm Beach. Situated near the beach, this aparthotel is within a 5-minute walk of Manchebo Beach and Eagle Beach. Links at Divi Aruba and Palm Beach are also within 2 mi (3 km). Located in Noord, this beachfront resort is next to a golf course and within a 5-minute walk of Fisherman's Huts and Palm Beach. Eagle Beach and Arashi Beach are also within 3 mi (5 km). 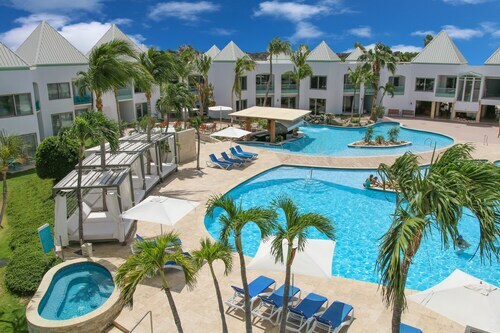 Comprising nearly 12 acres of gardens, ponds, waterfalls, and pools, this resort faces the white sands of Palm Beach in Aruba's high-rise-hotel district; Tierra del Sol golf is 3 km (2 mi) away. 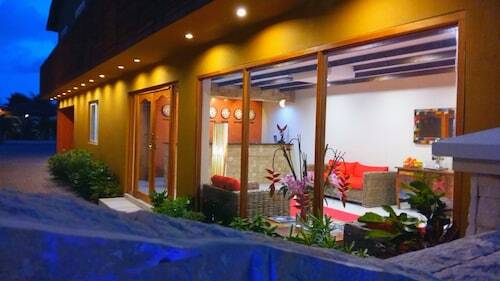 Situated near the beach, this aparthotel is within 1 mi (2 km) of Bubali Bird Sanctuary and Eagle Beach. Palm Beach and Manchebo Beach are also within 2 mi (3 km). 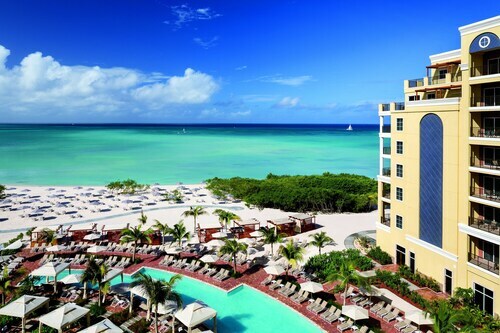 How Much is a Hotel Room in Aruba? 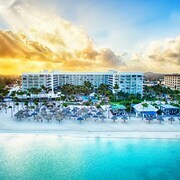 Hotels in Aruba start at C$118 per night. Prices and availability subject to change. Additional terms may apply. 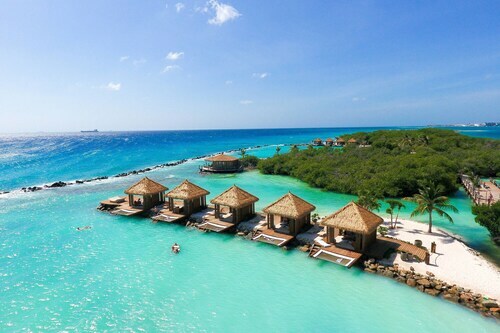 If you're looking for a break from the cold weather or are simply in need of a beautiful holiday any time of the year, you might want to think about heading to Aruba, one of the most popular islands in the southern Caribbean. It's not surprising that people flock here to take in the miles and miles of gorgeous, white sand beaches, and charming downtown areas. 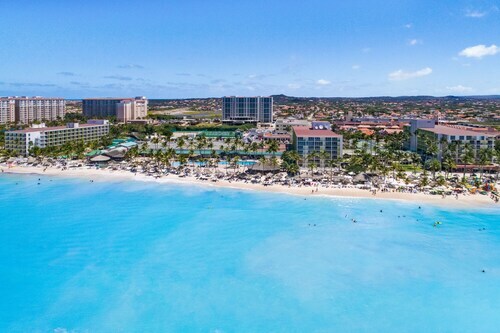 Book a room at one of the lovely Aruba hotels, and once you're there, you'll find there's much to keep you entertained and enchanted on this marvelous paradise. Start your trip to Aruba in Oranjestad, the main town on the island. 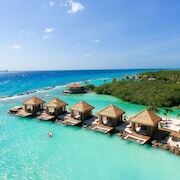 Here, you can find the most exquisite Aruba resorts and the best 4-star hotels in Aruba, along with tons of great shopping, dining, and decadence. It's a great town for taking two-hour strolls or using as a home base for day-trip cruises when you're feeling inclined to try out your sea legs. 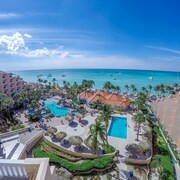 It's not hard to find Aruba hotels near the beach, so no matter whether you prefer cruising on the water or simply lying on the sand and taking in the sun and surf from a comfortable vantage point, you'll be happy you chose this place to call your short-term vacation home. 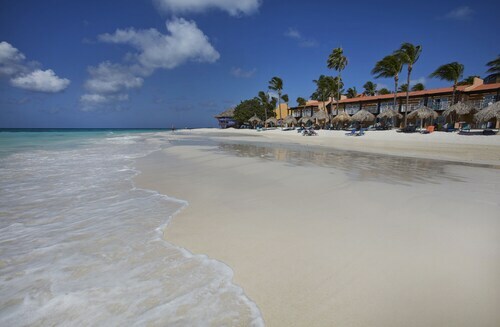 The reason many people go to Aruba is the beach, and luckily, the island has no shortage of stunning, swimmable coastline. Lay back in the white sands of Eagle Beach and get a tan, or swim laps in Baby Beach, often considered the beach with the calmest water in the Caribbean. At the end of the day, take a load off and enjoy one of Aruba's gorgeous outdoor bars for an appetizing frozen summertime cocktail and a sampling of some delicious, fresh Aruban fare. 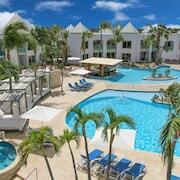 If you're planning a trip to Aruba, let Travelocity help. 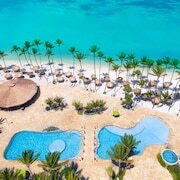 We make sure you find the best deals on cheap hotels in Aruba so you can sit back, relax, and enjoy your vacation. rooms were oceanfronts and water sports were good. the one improvement is the hour to check-in/check-out beach towels and equipment. the shop closes at 5:30, and the staffs are not very flexible..